The rate of growth in penetration of high-speed internet at home has slowed and could slow further after several years of rapid growth. The Pew Internet Project’s May 2005 survey shows that 53% of home internet users have high-speed connections at home, up from 50% in December 2004 – a small and not statistically significant increase. This compares unfavorably with growth rates over a comparable time frame a year earlier. 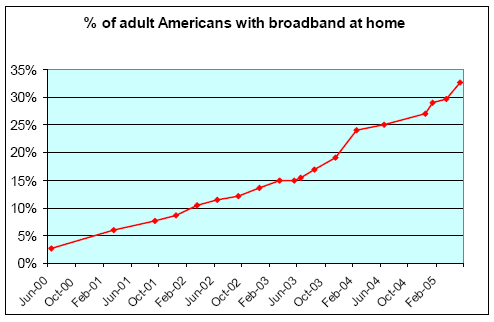 In May 2004, 42% of home internet users had high-speed connections, 20% above the 35% home high-speed penetration figure for November 2003. Comparative analysis of national surveys of internet users in 2002 and 2005 shows less pent-up demand today for high-speed connection in the population of dial-up internet users. The potential pool of potential adopters of broadband is comprised of several different groups that are either not large or declining. The largest group is comprised of moderately experienced dial-up internet users, i.e., those who have been online for more than a year but less than six years. In October 2002, 39 million people (or 34% of adult internet users) fell into this category. By May 2005, that number fell to 32 million (or 23% of adult internet users). The number of experienced (defined as those online for six or more years) dial-up internet users has fallen by one-third since October 2002, from 19 million to 13 million in May 2005. In October 2002, 38% of internet users had been online for six years or more, while 58% were in this category by March 2005. New internet users – defined as those online for a year or less – made up 4% of the internet population in May 2005, compared with 6% in October 2002. In May 2005, about 4 million people fell into the category of novice dial-up internet users. In this small group, the number of likely broadband adopters is quite small because few “newbies” have ever converted to broadband relatively soon after beginning their dial-up connections. Currently 32% of the adult population does not use the internet, a number that has held steady in the first six months of 2005. Few new users seem to be coming online and data show that just 23% of internet users who have adopted in the past year have done so with high-speed connections. It is not surprising that the share of dial-up users in the internet population is declining with the growth of broadband penetration. But with the slow rate of growth in the overall internet population, there has been an absolute decline in the number of dial-up users in the segments described above. Since few new internet users immediately adopt broadband connections, this points to slower growth in home high-speed subscriptions. Demographic and behavioral analysis of the large group of moderately experienced dial-up users suggests that members of this group are not attractive candidates for switching to broadband. Lower income – in 2002 23% percent of these dial-up users had household incomes under $30,000 annually and 22% had household incomes over $75,000 annually. By 2005, the distribution had changed to 36% of this group having household incomes under $30,000 annually and 13% having household incomes over $75,000 per year. Less educated – 28% of moderately experienced dial-up users were college graduates in the 2002 sampled versus 24% in 2005. Relatively apathetic about their internet use. In 2002, moderately experienced dial-up users had tried at one time 38% of the online activities asked about; in 2005 that number fell to 28%. This analysis may explain why some broadband providers have recently cut prices in order to lure more subscribers. This strategy may overcome some of the hurdles (e.g., low incomes) to adoption among moderately experienced dial-up users. However, this group’s relative lack of engagement with the internet and its advanced age might mean that a relatively smaller number of them will convert to broadband than their predecessors. People’s level of online experience – the number of years they have used the internet – is becoming a less significant factor in the overall demand for broadband. This is why there is less pent-up demand for home high-speed service in today’s internet population compared to 2002. In 2002, there were two factors that were highly significant in explaining online Americans’ intensity of internet use: the number of years of online experience they had and their connection speed. The heaviest internet users – those who did many online activities on a typical day – were those who had several years of experience. That meant that heavy dial-up users were primed to switch to broadband to alleviate their demand for bandwidth. These highly-engaged dial-up users processed a lot of bits online, making the dial-up wait more frustrating, and therefore pushing many of them to make the switch to broadband at home. By 2005, statistical analysis shows that the situation has changed. Years of online experience no longer has any significant impact on intensity of internet use, while having a home broadband connection is a much stronger predictor of the number of online activities that a user does on a typical day. This finding suggests that many experienced dial-up users switched to broadband in the 2002 to 2005 time frame. That is, the low-hanging fruit of dial-up users was harvested by broadband service providers. There is less of that easily-harvested fruit now and the profile of experienced users is different because they are not as fervid in their internet use. That explains why further growth in the broadband population is likely to slow down. This report is built around several national random digit dial telephone surveys of Americans (age 18 and older) conducted by the Pew Internet & American Life Project. Here is the detail on surveys referenced in this report. The Project’s May 2005 survey interviewed 2,001 Americans; 1,336 were internet users. For results based on the full sample, the margin of error is plus or minus 3 percentage points; for results based on internet users, the margin of error is plus or minus 2 percentage points. The March 2005 survey interviewed 2,201 Americans; 1,450 were internet users. The margin of error is plus or minus 2 percentage points for results based on the full sample and plus or minus 3 percentage points for results based on internet users. The December 2004 survey interviewed 914 Americans; 537 were internet users. The margin of error is plus or minus 3 percentage points for results based on the full sample and plus or minus 4 percentage points for internet users. The May 2004 survey interviewed 2,201 Americans; 1,399 were internet users. The margin of error is plus or minus 2 percentage points for results based on the full sample and plus or minus 3 percentage points for results based on internet users. The November 2003 survey interviewed 2,013 Americans; 1,358 were internet users. The margin of error is plus or minus 2 percentage points for results based on the full sample and plus or minus 3 percentage points for results based on internet users. The October 2002 survey interviewed 1,677 Americans; 1,027 were internet users. The margin of error is plus or minus 2 percentage points for results based on the full sample and plus or minus 3 percentage points for results based on internet users. The debate over the United States’ position in home broadband adoption is entered into in some circles with a passion usually reserved for the Bowl Championship Series in college football. The United States currently ranks 12th in the world in broadband penetration according to the Organization for Economic Cooperation and Development, down two slots since 2003, and 16th according to the International Telecommunications Union (Telecommunications Reports, 2005 and Technology Daily, 2005). Although the United States is clearly in the middling range in broadband lines per 100 people in OECD and ITU rankings, many U.S. officials question the rankings, observing that the geography of our sprawling nation as a reason the U.S. doesn’t stack up very well when measures of density are the focus (Martin 2005). FCC Chairman Kevin Martin and Acting NTIA Administrator Michael Gallagher, for instance, point to the rapid growth in recent years in broadband adoption as a signal of U.S. strength. This paper will trace broadband adoption in the United States in recent years, present a model of individuals’ adoption of broadband at home, and speculate about the growth path of broadband in the United States. Specifically, the paper will argue that the decision to get broadband at home is driven by intensity of online use, with nominal price points playing a very secondary role. Further, the paper will argue that intensity of online use, for an individual internet user, is driven by two things: years of online experience and connection speed. In the past several years, the role of online experience in explaining intensity of internet use has fallen, while the explanatory effect of having a broadband connection has grown. This is not surprising, considering the growth in broadband penetration in recent years. But the decline in the explanatory role of online experience suggests a diminished pool of potential switchers to broadband from the ranks of dial-up users. This analysis suggests that broadband growth in the United States may slow in the near term after several years of rapid growth. With overall internet penetration hitting a plateau in the United States, new internet users tending to adopt with dial-up connections (as this paper will show), and a shrinking pool of experienced dial-up online users, the fast pace of broadband adoption will be difficult to sustain in America. The paper will unfold as follows. It will first provide trend data on internet and broadband penetration in the United States from 2000 through the middle of 2005. It will then review briefly relevant literature on technology adoption as a means to motivate the model of broadband adoption that will be presented next. Next, the bulk of the paper will show how the workings of the “experiential model of broadband adoption” have shifted between 2002 and 2005, with the effect of online experience on the intensity of internet use diminishing in that time frame. The paper will conclude by discussing policy implications of the empirical findings. This represents a fast adoption pace, at least in comparison to other consumer electronic technologies. Bauer et.al. (2002) date the beginning of widespread cable modem availability to consumers to 1995 and digital subscriber line (DSL) service to 1997. Taking 1996 as a starting point, it took a bit more than five years for broadband to reach 10% of the population, a rate that is comparable to personal computers (4 years to reach 10%), compact disc players (4 and one-half years), and faster than cell phones (8 years to reach 10%), and video cassette recorders (10 years to reach 10%). The color TV took 12 years to reach 10% of the population (on the fast uptake of broadband see Horrigan, 2002b and Odlyzko, 2003). The path to 50% adoption for these technologies takes on some interesting twists for these technologies. Though very quick to reach 10%, it took the personal computer 18 years to reach 50%. Although relatively slow to hit 10% penetration, the VCR and color TV both sprinted to the 50% mark. One lesson is that a fast path to 10% adoption doesn’t always ensure a continuation of speedy technology adoption among consumers. The central argument of this paper is that the fast penetration rate, to date, of home high-speed internet in America may not be sustainable. The debate about broadband in the United States can be broadly categorized as having gone through three stages. The first might be cast as the “will it ever be economically viable” stage, which dates as far back as the 1980s. ISDN technology, at 64 kilobits per second, was developed in the 1980s, and the 1990s saw several trials by telephone or cable companies in providing high-speed infrastructure to homes in cities or parts of cities. None of these projects panned out (see Horrigan, 2002b, for a brief account of some these failed trials). The second stage might be called the “piggy back on the Web” phase. As email and Web use began take get a foothold in American life in the late 1990s, the investment for high-speed to the home improved. Telephone companies started to roll out DSL technology to neighborhoods. Cable companies upgraded to cable plant to allow cable modems to offer the internet over coaxial cable. Still, even as broadband uptake at home began to accelerate in the early years of the 21st century, anxiety remained in the form of the “chicken and egg” investment dilemma. Would enough quality content be developed for the internet to attract enough subscribers to home high-speed? Absent many high-speed subscribers, would there be enough investment incentives for content developers to create the nifty online services to move people to broadband? Rapid growth in broadband from 2000 to 2005 seemed to set aside this debate. Regardless of whether splashy online content was being developed, home broadband was compelling enough to move many people away from the dial-up modem column. The fast growth in U.S. broadband penetration did not remove all worries, however. The third stage represents these new concerns and is the “are we doing well enough?” phase. This places the focus on how U.S. broadband adoption looks in comparison with other nations and, as noted at the outset, the news is not all good. Some of the concerns raised in this phase include worries that the speed of U.S. networks significantly lags that of countries such as Japan and South Korea (Bleha, 2005). In the policy arena, there has been no shortage of advice on how to address America’s apparent laggard status in broadband adoption. Some have had a strong activist bent to them in that they issue calls to action. Charles Ferguson (2004), for example, advocates a series of policy measures, including structural remedies for incumbent telecommunications carriers and municipal investments in networks on an experimental basis. Thomas Bleha (2005) recommends a study effort by the President’s Information Technology Advisory Council (PITAC), and, more recently, Nortel’s chief executive called for a “new broadband vision” for U.S. communications policy. In a number of cities, with Philadelphia perhaps the most prominent, local officials are attempting to build city-wide high-speed networks. The market-oriented approach is reflected in recent FCC action to equalize the rules under which telephone and cable companies allow third party internet service providers to connect to their networks. This is designed to provide more certainty in the investment climate for companies, thereby enabling them to extend high-speed internet structure to areas which currently lack it, and upgrade the speed of existing networks. The market-oriented approach is also associated with those unwilling to allow municipalities to provide high-speed service. As Lassman (2005) argues, such investments put taxpayer money at risk and may disadvantage the private sector which does not have access to low-cost capital such as municipal bonds. Municipal governments also may not be able to move as quickly as the private sector in keeping up with advancing technology. Against these actions and recommendations are industry efforts to attract broadband subscribers. Several telephone companies have announced plans to offer home broadband packages that offer lower monthly fees for slower connection speeds than would be available from regular DSL service. Verizon, for example, in August 2005 announced a cut-rate price of $14.95 per month for high-speed service (following a similar announcement by SBC in June), for 768 kps service (New York Times 2005b). That is still broadband according to the FCC’s definition, but much slower than speeds currently offered for DSL or cable broadband service. These price discrimination strategies, though likely profit-maximizing for the companies, do not appear to represent a commitment by companies to invest in network upgrades. However, such strategies may turn some dial-up users into “slow” broadband users until such time as network upgrades occur. Still, about 60% of dial-up users say they don’t want broadband and, as a group, this segment of dial-up users is much less engaged with the internet than other dial-up users.9 It is not clear that a lot of this group would incur the switching costs involved in upgrading their internet service, given their relative indifference to the internet. The purpose here is not to pass any judgment on the viability of any of these phases of the broadband debate or policy prescriptions, but rather to point out that the focus on the horserace has obscured examination of the broadband adoption path among users over the past five years. U.S. broadband adoption has either been growing quickly, but not fast enough when compared with other countries. Relatively little attention has been paid to what’s going on beneath the growth of broadband adoption. Before discussing the model of broadband adoption, a brief review of the relevant literature on technology adoption will be helpful. The innovation itself, which must possess a number of characteristics in order to be useful to potential adopters. Not only must it be useful, it must overcome adoption uncertainties (e.g., cost, both financial and in terms of time spent learning how to use, compatibility with other technologies) and it must be possible for people to observe it and try it out. Communication channels by which people can find out about innovations. Time, i.e., the length of time it takes for a person to first learn of an innovation and undergo the decision process that may culminate in the decision to adopt and subsequent implementation of the new technology. The social system or perhaps, to adopt a more contemporary phrase, social capital: This means that how people organize to address common problems. How such rules and norms for addressing problems influences communication flows can, in turn, affect the diffusion of innovations. This motivates the Hall and Kahn review of technology adoption, as they note how innovations themselves often rest on the cumulative improvements in related technologies as well as numerous individual calculations among users, all in the face of uncertainties about the costs and benefits of adoption. In thinking about how this translates into modeling diffusion, Hall and Kahn discuss the classic “S shaped” curve that characterizes the unfolding path of technology adoption. The shape of this curve is, as Hall and Kahn note, subject to a variety of forces, and the history of technology diffusion in the 20th century shows lots of variation. Electric service, the household PC, and (especially) the VCR showed quick adoption patterns. The telephone and washing machine were showed a slower adoption path. Hall and Kahn discuss three strains of research which seek to explain the shape of adoption curves. The heterogeneity model assumes that individuals place different values on an innovation. Given a normal distribution of these values, declining cost of the technology in time, and that individuals choose to adopt when the value adoption in excess of cost, an S-shaped curve is the result. The epidemic model assumes that consumers have identical tastes and the cost of technology is constant over time, but that each consumer learns about the technology from a friend or neighbor. Because not all individuals learn of the technology at the same time, adoption depends on spreading familiarity about the technology through communication flows over time. From the economics literature, the “real options” model of adoption that views the decision to get a new technology as an investment decision characterized by uncertainty. In this framework, there is uncertainty over future benefits to adoption, an inability to recapture sunk costs to adoption, and the opportunity to delay adoption. People have a “call option” to purchase the technology at any time, but there is an option value to waiting to incur the costs. Importantly, this option value may mean it makes sense to wait until the benefits are somewhat above costs, because at that point the excess benefits reduce uncertainties associated with future benefits and recouping sunk costs. In each of these three frameworks, though especially the latter two, the element of time crucially enters into the adoption decision and thus shapes the adoption curve. As Hall and Kahn note, the elements that affect how time figures into adoption paths are various demand and supply factors in the market place. Most pertinent to a discussion of consumer technologies such as broadband are network effects on the demand side and the quality of the new good on the supply side. Network effects refer to the value of a given good or service being a function, in part, of the extent to which others have adopted it. Email is a great thing, but of limited use if there are only a few people (either in the world or, more realistically, one’s social or professional network) to email. As more people use email, the more valuable email is to those using it, and the more likely people are to adopt it. The availability of complementary services, such as online applications such as ecommerce, news, or gaming, may indirectly enhance the network effect of being online. On the demand side, early adopters of a new technology may have to deal with the kinks inherent in any innovation. Depending on the severity of these kinks, their existence might cause some potential adopters to wait until the problems are ironed out before adoption. In the context of high-speed internet connections in the United States, that has probably played a role. In a 2002 survey of broadband users, half said their connections didn’t work some of the time – something they would probably not tolerate from their telephone or electric service providers (Horrigan 2002b). This paper seeks to develop and defend an informal model of broadband adoption that explicitly takes into account the role of users’ time preferences in making the decision to buy broadband internet service. The model is motivated: a) by a number of questions asked in national random digit dial surveys conducted by the Pew Internet and American Life Project between 2002 and 2004, and; b) empirical regularities from a series of Pew Internet surveys that show online users do more things online as they gain internet experience. For openers, a question in Pew’s February 2004 survey asked respondents why they switched to broadband. About 60% respondents pointed to something having to do with the desire for speed – simply to download files faster (36%), often to do work at home more efficiently – while only 6% mentioned prices – either the price point being finally acceptable to them or a promotional offering. It was also the case that those who had been online longer were more likely to cite the desire for speed as a reason to get broadband than relatively inexperienced internet users. In digging into the gap in intensity of use and online experience, two things are consistently true in Pew Internet surveys: online users with greater experience (as measured by number of years online) and online users with high-speed internet connections are the most intense internet users (as measured by online activities engaged in). Doing a simple regression of intensity of online use on online experience, connection speed, and demographic characteristics, suggests that online experience and connection speed are significant explanatory factors driving intensity of use. It also clear from looking at the data on number of activities users do, that the gap between the number of activities an experienced dial-up user did on the average day and the number for broadband users was not that great in 2002. Out of 16 activities asked about in 2002, experienced dial-up users (defined as those online for 6 or more years) did 4 internet activities on the typical day versus 4.7 on average for broadband users. In 2005, however, the gap was much greater, with broadband users trying 2.8 (out of 12) activities on the typical day with experienced dial-up users doing 1.7 activities. Put differently, broadband users were 18% more active online than experienced dial-up users in 2002, but 65% more active in 2005, when number of online activities done on the average day is taken as the measure of intensity of use. This widening gap in intensity of use between experienced dial-up and broadband users suggests that experience matters less in explaining intensity of internet use in 2005 than it did in 2002. The reason is probably because many experienced internet users in 2002 have switched to broadband. But it also could be because there are fewer experienced internet users in 2005 than in 2002; perhaps not a lot of new users have entered the internet population in that time frame and, if they have, few probably started out their online careers with high-speed at home. 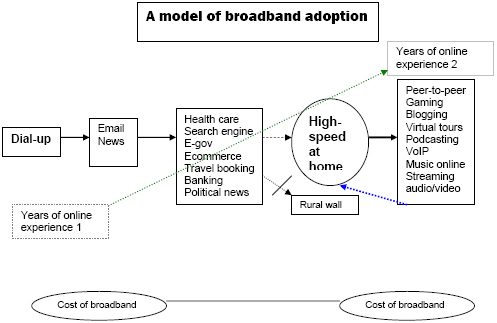 Other data points that help shape the model concern questions asked of dial-up users in 2002 and 2004 about whether they would like to adopt broadband. In both surveys, about 40% of dial-up users said they wanted to get broadband and about 60% said they weren’t interested in getting it. It was also the case that those dial-up users with lots of online experience (defined as those online for 6 or more years) were more likely to say they wanted broadband (53% did) than other dial-up users (Horrigan, 2004). People do more things online the longer they’ve been online. Dial-up users are more likely to want broadband the longer they’ve been online. Not everyone wants broadband – and these are typically people with less online experience who are processing fewer bits. High-speed users switch to broadband in order to process more bits, less so because of price. This suggests a model, pictorially represented below, whereby the decision to get broadband depends on intensity of internet use, which is a function of time and connection speed. As people do more things online, their online time preferences may change. To take a simple example, the value of being online, or, to put it differently, the real price of an internet connection, when processing 2000 bits per month while paying a $20 dial-up fee is the same as processing 4000 bits per month at a $40 fee for high-speed. As this growth in the number of bits processed tends to occur over time, people may grow more impatient with their dial-up connection and the more expensive broadband connection may seem sensible, because it has equivalent value on the “bits per buck” calculation. Under what conditions does this model suggest quick broadband uptake among Americans and under what conditions does it suggest slow uptake? For the individual, the model suggests that experience drives the number of online activities people do, which then could (though not inevitably) prompt the switch to the high-speed connection, which in turn leads to greater internet use. Greater internet use among very experienced internet users could, as depicted by the blue arrow, lead later adopters to switch to broadband. In the very early stages of adoption, one would expect years of online experience to have a significant effect on overall intensity of online use in the population. With relatively few high-speed users and many experienced dial-up users doing lots of things on their dial-up connections, online experience is likely to matter in explaining overall intensity of online use, in addition to connection speed. At the other extreme, a world of high (though not 100%) broadband penetration would have connection speed explaining a great deal of the intensity of online use, since the switch to broadband is associated with an increase in intensity of internet use. At some intermediate stage of adoption, the relative effects of connection speed and online experience is less clear. However, if one wants to see a strong upward penetration path, one would want the data to show great impatience in the internet population, even at this intermediate stage. This would show up as a sizeable “online experience” effect, relative to connection speed. That is, with number of years online explaining a great deal of intensity of internet use (again, relative to connection speed), one could reasonably suppose that many users are poised to switch to broadband to alleviate their impatience. To explore the connections between intensity of online use, connection speed and years of online experience, I employ regression analysis on data from two points in time along the broadband adoption curve, one in October 2002 and January 2005. These datasets have two important virtues in looking at the model depicted above. First, broadband penetration rose sharply over that time frame, from 24% of home internet users in 2002 to 50% of home internet users by January 200512. This allows a comparison of the effects of online experience and connection speeds at two very different points along the adoption curve. Second, both surveys asked respondents several questions about technology use that are not directly connected to intensity of internet use, namely number of computers in the household and whether the respondent uses a cell phone. This helps in confronting the fact that causality flows both ways in the model depicted above. Connection speed logically affects the amount of online activities one might engage in, but a person’s own habits of online use influences the decision about connection speed. This allows two-stage least squares (2SLS) estimation to be employed to address the model’s endogeneity. In carrying out the 2SLS estimation, instrumental variables for the model are: number of computers in the house, income, age, educational attainment, and gender. The dependent variable in the second stage of the estimation procedure is the number of internet activities a respondent does on the typical day. In October 2002, internet users were asked about 12 different online activities, while the January 2005 survey asked about 19. For the October 2002 data, an internet user, on a typical day (that is, their answer to a question about what they did online yesterday), tried 1.5 activities on average and had, at least once, tried 5.0 of the activities queried. For January 2005, an internet user tried an average of 1.9 activities on the typical day and 6.5 at least one time. Results: What kind of adoption curve? 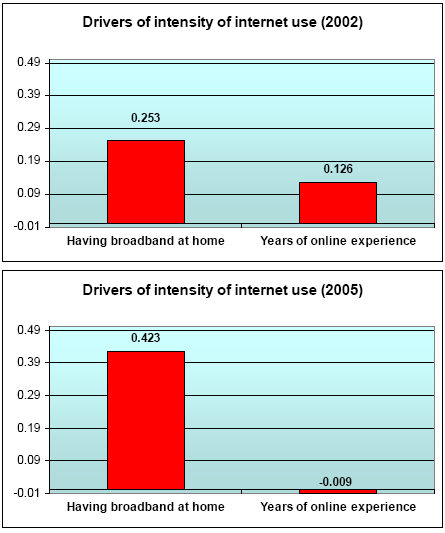 The similarity in the October 2002 and January 2005 datasets permit apples-to-apples comparisons of the effects on intensity of internet use of online experience and connection speed over that time frame. The charts below plot the standardized coefficients for the effects of online experience and connection speed on intensity of internet use. With the exception of “years of online experience” in 2005, whose coefficient estimate is not significant, each of the other coefficients is significant at the 1% confidence level. The results of the two-stage least squares estimation show that in 2002 having a broadband connection at home had influence on intensity of internet use that was about twice the impact of years of online experience. By 2005, the magnitude of the home broadband connection’s influence on intensity of online use was much greater, while there is no longer a significant impact of years online experience. If years of online use are viewed as a proxy for pent-up demand for online speed, the results suggest that there is little evidence of pent-up demand for high-speed in the 2005 internet population in contrast to the 2002 internet population. On the one hand, this is not too surprising – early adopters, the “low hanging fruit”, have been picked. But it is important to recognize that there could be very different migratory patterns toward broadband. Internet use, rather than tapering off in recent years, could have continued its late ’90’s-early 00’s upward climb. Broadband prices could have been on the decline or network speeds might have improved substantially. That or other forces might have meant more switching from dial-up to high-speed and more adoption “de novo” of high-speed by new users. None of these things have happened. Overall internet penetration seems to have settled into a comfortable middle-age pattern, with the share of online adults hovering in the low 60% range in 2002 through 2004 and ticking up to 68% in early 2005. Fewer new users are coming online and those who do tend to start out with dial-up connections. In March 2005, 6% of internet users had been online for a year or less, compared with 21% who said this three years earlier. According to Pew Internet Project combined November 2004 through March 2005 data, only 23% of internet users online for a year or less were broadband users, less than half the rate for all internet users. Two other facts fill out the portrait of broadband penetration. First, the pool of experienced dial-up users – those most likely to switch to broadband – has decreased. In October 2002, there were 19 million dial-up internet users with 6 or more years of online experience. By March 2005, that number had fallen by about a third to 13 million. Second, as noted, the growth home high-speed subscribership in the past few years occurred while prices for broadband were flat. Broadband users in October 2002 reported a monthly bill of $38 while users surveyed in February 2004 reported a monthly bill of $39, during which time home high-speed adoption grew from 24% to 42% of internet users. One clear contribution of this paper to the policy debate is that the broadband problem – if defined as pace of consumer uptake – is not taking care of itself with the passage of time. A declining pool of the most likely broadband adopters – experienced dial-up internet users – and few new internet users coming online (and relatively few of those adopting with broadband connections) suggest slower growth in home broadband than has been in the case in the past several years. The raw numbers tell part of the story, but the multivariate analysis tells the rest. Online experience explains none of the intensity of online use for individuals in 2005, whereas it had a significant effect in 2002. This suggests a population of internet users less likely to make the jump to broadband in 2005 than in 2002. From the perspective of the theories of technology adoption outlined earlier, this pattern seems in line with the “real options” theory summarized by Hall and Kahn. For some Americans – current dial-up users and non-adopters – it pays to wait before adopting high-speed internet at home. The sunk costs of a computer, the switching costs of going to broadband (and perhaps switching email addresses), and the learning curve of trouble-shooting networks, all may conspire to keep some people off the internet or content with dial-up. It may also be, to borrow from Rogers, that people delay in exercising their “option value” on the technology because they do not have a robust social system nearby to aid in the process of technology adoption. In the mix of policy ideas laid out at the outset – from sweeping calls to reform to market-oriented approaches advocated by the FCC – where does a finding of slowing broadband adoption fit in? The answer depends on how one assesses the opportunity cost of people not having broadband, or having relatively slow broadband connections at home. One estimate places the economic benefits of widespread broadband adoption at $500 billion for the United States (Crandall, 2001). At the individual level, no such quantification exists, although the Pew Internet Project has documented the self-reported benefits to internet access among users who go to health care and medical information sites online, use e-government, seek out political news and information online, and various measures of social connectedness. The Pew Internet Project has also found that having a high-speed connection is associated with a greater likelihood of taking advantage of these Web sites (see Horrigan, forthcoming, on cross-cutting findings from the Pew Internet Project). Certainly there are economic costs to not having a “high-speed economy” and there are good reasons that those without high-speed internet at home miss out on various “social goods”. An implication of these findings, then, is that policymakers, especially with the Telecom Act of 1996 likely to be rewritten soon, will undertake that task in the context of increasing calls for policy experimentation. It will be a challenge for policymakers and analysts, especially with the Telecom Act of 1996 likely to be rewritten soon, to craft a framework for satisfying demands for action at the state or local level that allows for constructive policy experimentation, not governmental failure.